The truth is, Organic Lawn Care can take a bit longer to be effective, but the results are well worth the wait. Our earth-friendly approach creates a healthy, beautiful lawn from the inside out. Organic fertilizers nurture healthy soil and naturally thick grass, while natural feed and weed treatments build your lawn's resistance to new weed growth. You'll enjoy peace of mind knowing that your kids and pets are playing on a safer, chemical-free lawn. Read on below for a full explanation on why we feel organic lawn care is the way to go in Ohio. And make sure to check out the graphical illustration at the bottom of this page that will convince you of why we should be your lawn service company in Ohio! Today there is a growing concern among environmentally-conscious homeowners regarding the chemicals being used to treat their lawns. But now, rather than blanketing our lawns with harmful chemicals, there is a healthy alternative...Good Nature Organic Lawn Care. Click here for More Information about the risks associated with lawn chemicals. Here's more information from Rodale about the dangers of using lawn chemicals around your pets. And if that's not enough, here are a few more reasons to avoid pesticides. The good news is that you don't need the chemicals! If you have pets, you might be interested to read more about pets and lawn chemicals. You've heard the saying, if it sounds too good to be true, it probably is". That goes for lawn care as well. Take the junk mail ad that boasts, "Get your first lawn treatment for only $29.95". But what are you getting for that price? What you get is a yard full of chemicals that stimulate rapid grass growth. But, this rapid growth comes at the expense of root growth so your lawn is now more susceptible to drought stress, disease, and grub problems. This is when that $29.95 lawn treatment starts to multiply. Now you've got bugs and diseases in your lawn. Don't worry; the chemical lawn care company can fix you right up with poisons to take care of all the bugs, and diseases. Of course, there will be an additional charge for that. By caring for your lawn organically, over time you'll have fewer and fewer problems requiring less and less service...not more service! It all adds up. Organic lawn care is not only better for the environment, but it's better for your kids, it's better for your pets and over the long term, it's better for your wallet! The negative effects of synthetic fertilizers and pesticides on our environment are well documented. Do you like seafood? Scientists tell us that, as a result of fertilizer pollution, there are now "dead zones" appearing in lakes and oceans around the world where no marine life is growing. Also, all animals are adversely impacted by synthetic chemicals used on lawns. In fact, it is estimated that 67 million birds are killed annually by pesticides. Our Natural Fertilizers work with Nature...feeding and building the soil. Not against it...like synthetic fertilizers. Over time, you'll find that your soil and lawn become healthier. Chemical lawn care companies tend to solve lawn problems by applying more and more chemicals on them. First, their chemicals encourage quick grass growth...which can make your lawn more susceptible to pest problems. Then they spray on more chemicals to solve the pest problems. In addition to killing the target pests, these chemical sprays can weaken or kill beneficial organisms. When the pests return, they find weakened grass and weakened predators. That's when the chemical companies apply even more chemicals. It's a never-ending cycle...and your poor lawn is the loser. At Good Nature, we take the opposite approach. We work with nature to feed and condition your lawn to make it healthier and hardier...the natural way. We use organic materials to increase your lawn's natural defense system...making chemical treatments less necessary. If a pest does get out of hand, we will recommend a solution that is both biologically and environmentally responsible. What's the Difference Between Organic Fertilizers and Synthetic Fertilizers? Here's a graphical depiction of what happens when you put down Synthetic Fertilizer compared to when you put down Organic Fertilizer. Highlight your mouse over any image for more information. 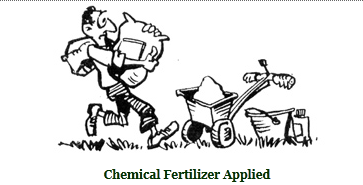 The Difference Between Organic Fertilizers and Synthetic Fertilizers Roll your mouse over each illustration below to learn more.